CORCY, France (Reuters) - Armed and masked anti-terrorism police swooped on woodland villages northeast of Paris on Thursday in a manhunt for two brothers suspected of being the Islamist gunmen who killed 12 people at a French satirical weekly. The fugitive suspects are French-born sons of Algerian-born parents, both in their early 30s, and already under police surveillance. One was jailed for 18 months for trying to travel to Iraq a decade ago to fight as part of an Islamist cell. Police said they were "armed and dangerous". U.S. government sources said Said Kouachi and his brother Cherif Kouachi were listed in two U.S. security databases, a highly classified database containing information on 1.2 million possible counter-terrorism suspects, called TIDE, and the much smaller "no fly" list maintained by the Terrorist Screening Center, an interagency unit. Dave Joly, a spokesman for the Terrorist Screening Center, said he could neither confirm nor deny if the Kouachis were listed in counter-terrorism databases. 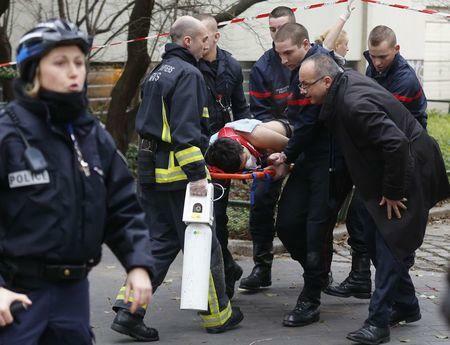 In Paris, a policewoman was killed in a shootout with a gunman wearing a bulletproof vest on Thursday morning, setting a tense nation further on edge. 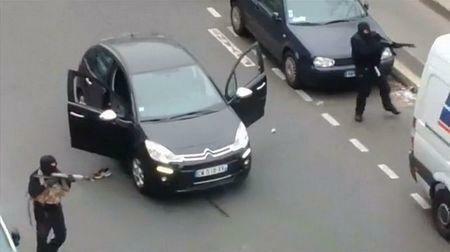 Police sources were unable to say whether that incident was linked to the previous day's assault at the Charlie Hebdo weekly newspaper, but the authorities opened another terrorism investigation. Searches were taking place in Corcy and the nearby village of Longpont, set in thick forest and boggy marshland about 70 km north of Paris, but it was not clear whether the fugitives who had been spotted in the area were holed up or had moved on. In neighbouring Longpont, a resident said police had told villagers to stay indoors because the gunmen may have abandoned their car there. Anti-terrorism officers pulled back as darkness fell. The silence ‎was broken by the sound of a forest owl. The younger brother's jail sentence for trying to fight in Iraq a decade ago, and more recent tangles with the authorities over suspected involvement in militant plots, raised questions over whether police could have done more to watch them. "He was part of a group of young people who were a little lost, confused, not really fanatics in the proper sense of the word," lawyer Vincent Ollivier, who represented Cherif in the case, told Liberation daily. In 2010 he was suspected of being part of a group that tried to break from prison Smain Ali Belkacem, a militant jailed for the 1995 bombings of Paris train and metro stations that killed eight people and wounded 120. The case against Cherif Kouachi was dismissed for lack of evidence. A third person wanted by police, an 18-year-old man, turned himself into police in Charleville-Mézières near the Belgian border late on Wednesday. A legal source said he was the brother-in-law of one of the brothers. French media quoted friends as saying he was in school at the time of the attack. In the wake of the killings, authorities tightened security at transport hubs, religious sites, media offices and stores. Police also increased their presence at entry points to Paris. At Porte d'Orleans, one of the capital's main gateways, more than a dozen white police vans lined up the main avenue. Officers stood guard with bulletproof jackets and rifles. The defense ministry said it sent 200 extra soldiers from parachute regiments across the country to help guard Paris. Tens of thousands of people attended vigils across France on Wednesday, many wearing badges declaring "Je suis Charlie" in support of the newspaper and the principle of freedom of speech. 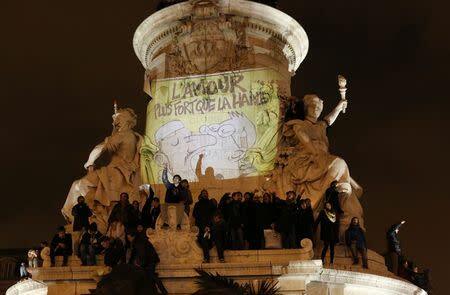 Newspapers in many countries republished Charlie Hebdo cartoons. Britain's Daily Telegraph depicted two masked gunmen outside the doors of Charlie Hebdo saying to each other: "Be careful, they might have pens." Charlie Hebdo's lawyer Richard Malka said the newspaper would be published next Wednesday with one million copies compared to its usual print run of 60,000. Muslim leaders condemned the shooting, but some have expressed fears of a rise in anti-Islamic feeling in a country with a large Muslim population. The window of a kebab shop next to a mosque in the town of Villefrance-sur-Saone was blown out by an overnight explosion. Local media said no one was hurt.